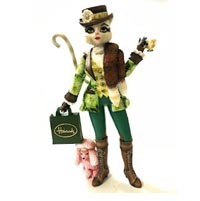 Kitty O Hunter | Alley Cats Standard Figurines | One Price Low Flat Shipping! From the Alley Cats Retired Hobbies Collection by Margaret Le Van, Kitty O Hunter Tattler. Made of hand-paintd resin. Measures 7.5" tall. Manufactured by Artisan Flair, Inc. This upscale feline enjoys fox hunting. She is outfitted as any proper British lady cat would be. 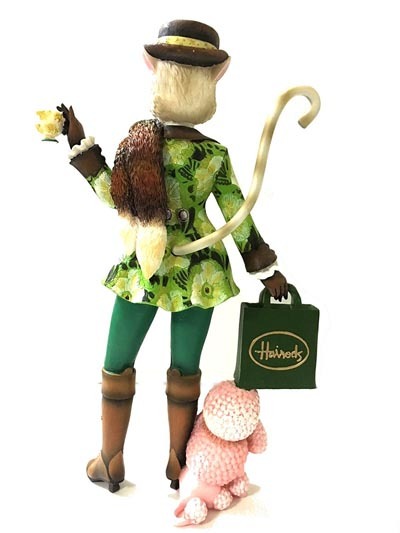 She is holding a tea cup, donning stylish boots, wearing a chic riding hat, a fox tail stole, magnificently tailored designer clothing, and is holding a shopping bag from famous Harrod's of London department store. She is cast holding with her toy pink poodle. The detail to this rare Alley Cat is amazing. Brand new in box. Great Gift, Great Margaret Le Van Collectible!